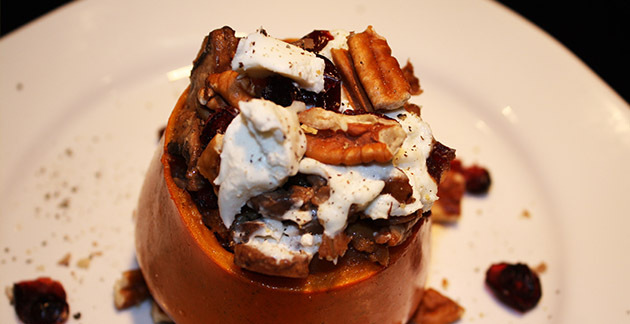 As fall approaches and many are getting ready to go hunting, think of giving this recipe a try. Cut persimmons about 1/3 way down from the top (the stem is at the bottom), scoop and cut out the inside of the fruit keeping the skin intact. Put skins aside. Dice the removed persimmon fruit removing all cores and seeds. Sauté the onions and persimmon fruit until cooked through, about 5-10 minutes or until the dry woodiness is gone when tasted. Add ground venison and brown. Add mushrooms, pecans and garlic until just cooked through. Add red pepper flakes and salt and pepper to taste. Place the persimmon skins on an oven dish that has been sprayed with canola oil. Scoop the stuffing mixture in to each skin and pack down lightly. Preheat oven to 350F and bake the stuffed skins for about 15 minutes. Remove and add 1 Tsp. goat cheese to each top, then sprinkle with pecan pieces. Put back in the oven for 5 minutes until cheese melts and serve.